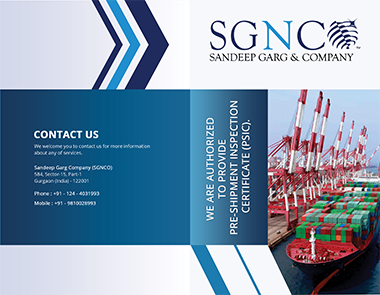 Quality testing process at Sandeep Garg and Company (SGNCO) follow a systematic approach to check whether the development and production of services and products meet specified requirements. The quality control and pre-shipment inspection implemented are integral towards building up the credibility of a manufacturer as well as increase customer confidence. Our quality control and pre-shipment inspection processes work towards improving the efficiency of the production stages, enabling manufacturers to compete better in the industry. Key testing procedures like geo-chem testing, soil testing, and metal tests at SGNCO employ various chemical formulations and analytical techniques to assure defect-free manufacture. The tests are based on stringent quality control norms to ensure the requisite quality of the metal scraps based on stipulated standards. These standards are on par with international standards, and are duly adhered to by SGNCO. The XRF is short for x-ray fluorescence. This is a process in which electrons are displaced from their orbital positions which releases a burst of energy. This burst is characteristic of the specific elements that are under test. Opting for a spectro gun rental can help record the release of energy, which can help the exact and quick categorization of the elements. Spectro gun testing is ideal for a number of applications in producing, processing and recycling of metal. Spectro gun testing, which we extensively advocate at SGNCO, is a superior methodology for when the exact analysis of metal is required. This methodology is perfect for recognition of materials when the metals are hard to identify or the number of samples is plenty. The spectrometer testing offers various ergonomic advantages for on-site operations. Spectro gun testing is ideal for a number of applications in producing, processing and recycling of metal.Spectro gun testing, which we extensively advocate at SGNCO, is a superior methodology for when the exact analysis of metal is required.This methodology is perfect for recognition of materials when the metals are hard to identify or the number of samples are plenty. The spectrometer testing offers various ergonomic advantages for on-site operations. Metal and alloy testing are one of the specialties of SGNCO alloy testing services. All types of non-ferrous and ferrous metals and alloys can be tested, and an instant result for the alloy composition testing can be provided. The alloy libraries include 500+ grade specifications of elements like Cd, Ti, V, Cr, Mn, Fe, Co, Ni, Cu, Zn, W, Hf, Ta, Re, Pb, Bi, Zr, Nb, Mo, Pd, Ag, Sn, Sb PLUS Mg, Al, Si, P and S. The alloy composition testing and other alloy testing services rendered by SGNCO are focused on complete quality assurance. Metal composition testing is a procedure that is used to check the composition of unknown metallic samples. The metal composition testing may also include determining properties of forged alloys. SGNCO performs chemical analysis testing as well as specific procedures for gold karat assessment.